The bengal cat is a cross between a domestic queen and the wild asian leopard cat. They are a most exciting breed of domestic cat and they are bred to resemble their wild ancestors, yet have a loving, friendly disposition equal to any other domestic cat. Attempts have been made to re create the jungle felines by crossing the small asian leopard with a short haired domestic cat. 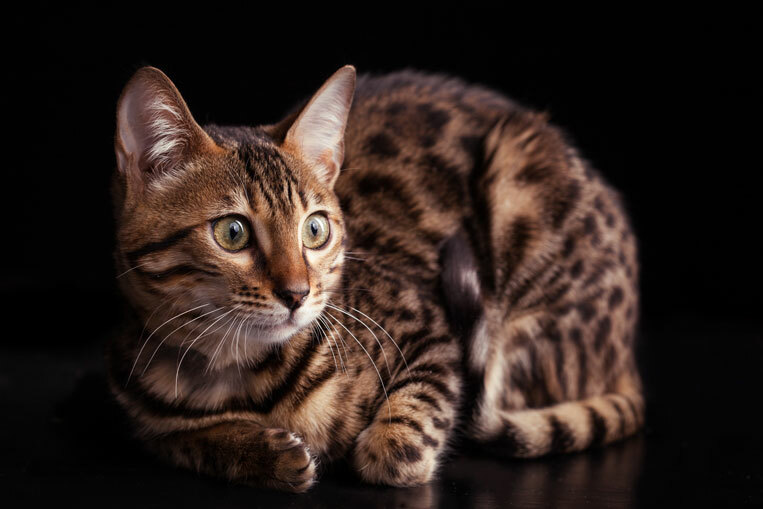 the primary domestic cat used, is the Egyptian- Mau, which is another spotted cat.Other domestic cats that have been used- the Ocicat, the Abyssinian, The Bombay and the British Blue. In 1983 Mrs. Jean Mill (USA) registered with the T.I.C.A. The first hybrid cats. The first Hybrids exhibited at an American show, was in 1985. At present there are other Leopard cats being used in various breeding programs. Bengals are Large cats, Males 15 pounds, up to 22 pounds. Females 10 -12 pounds. The traits from the wild are, they love water, pick objects up with their front paws, stalk, retrieve and hunt. Love to climb and are dependable. They often talk to their owners, voices are raspy and sound wild. They use litter boxes, get along with children, relate well to other animals and do not get defensive.The Bengal considers he is superior and always in charge.Leopards and Sorrel cats go through many stages before they develop their true colour. Around the two month stage, they go through a fuzzy stage, reaching full rich colour at 12 -16 months.